Author : David Watts Jr.
Hope in Hungnam is a novel about the Korean War that incorporates the historical and record-breaking rescue of North Korean refugees by USS Meredith Victory, a US Merchant Marine cargo ship on Christmas Eve 1950. The story centers on a US Marine private named Jack Stiles, who searches for meaning in not only his assignment, but also in United States involvement in what he considers to be a civil war of animals. Stiles fights alongside his childhood friend in the doomed Chosin Reservoir battle against North Korean and Chinese forces. The US forces are ordered to retreat to Hungnam for evacuation, inspiring a flood of North Korean refugees to flee as well. In the course of the private’s horrific experiences of the war, Stiles meets a North Korean woman who saves him and puts a compassionate face to the people that he had despised. Watts creates compelling characters in his debut novel, drawing readers in and engaging them in the characters’ welfare and the outcome of their choices. Fictional character Jack Stiles is portrayed with depth and sincerity in his principles, whether right or wrong. US Merchant Mariner Captain Leonard P. LaRue, the real-life hero and captain of the USS Meredith Victory, provides the backbone of faith to this story. References to his Christian faith are not overbearing but are shown with true and unwavering conviction. Jang Tae-bok, Stiles’s fictional counterpart, is a young North Korean mother to two young boys and sole caregiver to her elderly father. Jang is portrayed respectfully and convincingly and, along with her father, represents the “Korean side” in this story, showing compassion, humility, honor, and determination to do what is right, not easy. Other characters are equally well developed, many of whom were actual crew members of the USS Meredith Victory as well as two actual North Korean refugee passengers.David Watts Jr. does a wonderful job of storytelling. He has a distinctive voice and is able to vividly populate the reader’s mind with images of the characters and the locations in which they interact. At times Watts’s writing is quite poetic in his descriptions. Technical jargon is used minimally but effectively so that the reader understands the narrative without having to possess any such vocabulary of his or her own. Dialogue between native speakers with one another is realistic and draws the reader in. However, the dialogue between Stiles and Jang and her father is less probable in the fluency with which the Korean speak. I would have found it much more believable if the Korean speakers spoke in broken English. Otherwise, Watts has obviously done a lot of research on this novel to portray the real-life people, places, and events thoughtfully, respectfully, and sincerely.Hope in Hungnam explores the spiritual underpinnings of our actions and responses to those around us and especially those whom we do not understand. The story challenges us to reflect on our convictions and our reasons for pursuing the things that we do and to move out of our comfort zones to choose what is right instead of what is easy. This novel also serves to salute our brave military forces in solemn gratitude.This story has a distinct spiritual layer woven throughout LaRue’s narrative. Although the other characters do not profess a Christian faith, many of them choose an honorable path when pressed, which aligns with Christian ideology. The language used throughout is inoffensive despite the author’s portrayal of war as a brutal and relentless killing field.Structurally, the narrative begins and ends in our own contemporary time. Sandwiched in the middle is a narrative that begins with World War II and then transitions into the Korean War. The general narrative is from a third-person omniscient perspective. This choice of point-of-view (POV) is the “classic” narrative approach and would be familiar to many older generations who may have personal connections to the Korean War. However, today’s reader may need a few chapters to adjust to this technique because character-based POVs have become the new standard for fiction. My only regret is the few moments of “head-hopping” that occur in a very few scenes where the reader is allowed to peek into the minds of more than one character during a given scene. This, unfortunately, introduces some minor confusion and disorientation for the reader. Despite the limitations of third-person omniscient POV, Watts did a spectacular job in engaging the reader by appealing to the reader’s emotions and drawing out a desire to learn how a character fares due to choices made or circumstances encountered.Overall, I found this to be an enjoyable read. The historical context is fascinating, and the use of a fictional narrative brought this pivotal and grief-stricken episode in the history of our world to life, evoking in me compassion, grief, sorrow, reflection, and deep gratitude to our service people who served in Korea and other wars and who serve now to protect God-given human rights around the world, affording Americans in particular great privileges today. 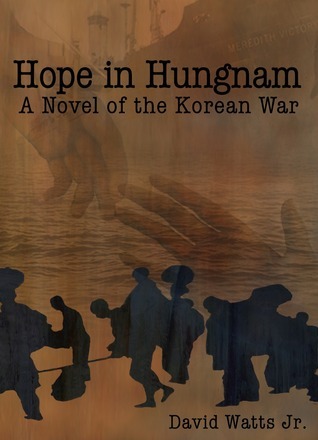 Hope in Hungnam takes place during the darkest and coldest days of the Korean War. The year was 1950. In fact, it was 62 years ago this week that the events described in this book unfolded. The setting is the brutal Battle of Chosin Reservoir and the interwoven story of one of the victory ships voyage and the story of one Korean father and son who flee the oncoming Chinese. It culminates in the stunning Christmas Eve evacuation of approximately 100,000 civilians from the port at Hungnam, North Korea. The main character, US Marine Jack Stiles, a country boy from west Texas, finds himself suddenly in the midst of a hopeless situation and desperately searches for meaning in the frozen killing fields of North Korea and along the evacuation route from the battleground.Jack Stiles’ world is changed forever when he loses a childhood friend and fellow Marine. He, himself, is critically wounded at Chosin Reservoir and nearly left for dead. En route to be evacuated and to recover from his injuries his medical transport is ambushed outside a primitive shack that is home to a North Korean woman and what is left of her family and all but him are blown to bits by an exploding mine. He is again left for dead on the frozen ground of North Korea. Nursed back to health by the enemy, he soon faces the realities of war, life, death again, and love with new understanding. Hope in Hungnam tells the story of the woman who saved him, the ship Captain who saved them all, and the ship that did what has never been done before or since. In the end, it is a story of war and hate, of love and forgiveness. But most importantly it is a heart wrenching story of the enduring power of hope.I sought this book out because of the connection between the setting and several members of my family. My dad served in Korea during the war. And at least 2 of my uncles served in Korea during the war. One of them was a Marine and I believe that he fought at the Chosin Reservoir. So, I had personal interest in reading this book. I will not pretend to understand the conditions that our brave Marines encountered at the Chosin Reservoir. I will just say "Thank you" for what you did and for how bravely you fought against the waves of Chinese that came across the boarder to overwhelm you. I thought this book was awesome! I had never heard anything about the Chosin Resevoir or the SS Meredith Victory and the amazing rescue that this ship and its crew were able to accomplish. The historical facts were relayed in a manner that was interesting, I never once got bored with this book like a do a lot of other historical books that center around a historical event. I thought this was a truly moving book that hits intellectually and emotionally. The love story that was played out in the book between Jack and Tae-bok was a nice story and gave faces to both the Korean and the American people that were in this war. I liked that in the beginning Jack did not see the Korean's as any different than animals yet was able to come to appreciate them and their culture as people and something worth saving. Even though Tae-bok had a lot of sadness and anger from the death of her husband she was still able to save Jack and show him that the Korean's were people. Great part of the story!I thought this book was easy to read, Watts transitioned through the story to make a smooth read that included a lot of great characters. I'm glad I got to read about them all. I would recommend this book it is a very good read. A five ***** review for "Hope in Hungnam" by David Watts David Watts takes readers back to 1950 and leads them on an inspiring journey through the darkest days of the Korean War - days in which men bleed and die in order to save an entire generation of people from North Korea.Hope in Hungnam takes place during the darkest days of the Korean War in 1950: from the brutal Battle of Chosin Reservoir to the stunning Christmas Eve evacuation of 100,000 civilians from Hungnam, North Korea. As the flames of war engulf the Korean Peninsula, US Marine Jack Stiles desperately searches for meaning in the frozen killing fields of North Korea. Dear Readers: I am not a history buff but I didn't want to stop reading "Hope in Hungnam". The author had me hooked from the first chapter. It is a thrilling tale of love and loss, joy and pain. From the heart-wrenching events of the parent/child relation to the heart-pounding accounts of enemies on the battlefield, David Watts Jr. delivers an emotional narrative on this near forgotten war and the people involved! I received a copy of this book from a GoodReads giveaway. The book me was something a little bit more than just a quick read so I was very happy to be chosen as a recipient. My grandfather served in the Korean war. He was shot and wounded while helping another wounded solider and was suppose to receive a purple heart. He never has though we have fought and fought for them to give him the recognition he deserves. He refuses to talk about his time over there so I know very little about what he has been through. The only thing I do know was that he had to crawl through a rice fields which is why rice is banned from his house a tradition my father carried over to his home that I grew up in.This book to me gave me such an understanding that I would have never had otherwise of the war and what my grandfather had been through. It was so realistic and quite emotional for me to read but nonetheless I am glad I did. Thank you. I just finished a trip backward in time to the Korean War. What a harrowing experience!The bravery and compassion that was detailed in Hope in Hungnam certainly was never hinted at in my history classes...in fact the Korean War was just glossed over!I was just a small child when my Uncle was sent to the Korean War and it wasn't until I met my husband, who was part of the peace time troops in Korea during the mid 1960s, that I really became aware that there were many stories to be read and heard coming out of that time.Mr. Watts has created strong well-developed characters to relate his story of people trying to remain human in an inhumane situation. He even chronicled their individual struggles with heart. and was able to actually make me feel the frigid temperatures and wonder at the power of hope and the see strength we all have inside of us. This book is about the Korean war it follows a Marine by the name of Jack Stiles from the worse attack in during the war ( the Battle of Chosin Resevoir to miracle when the merchant marine ship evacated all those Koreans that one christmas eve.) But between the battle and christmas eve Jack was saved by korean woman and her family- this book is about the war- how they met and fell in love.I would highly recommend it to all. It is a very fast read book. David Watts Jr is brings the characters alive and the makes you feel like you right there. I have received this book from Goodreads! This book was really good and actually made me feel like I was there, it was so realistic! This book definitely shows that there was a lot of effort put into it with very realistic opinions of politics and wars as well as very realistic characters and very vivid descriptions of the places. I had the privilege of editing this book from an earlier draft to completion. David has done his research and brought an incredible, forgotten story to life again. In a dark world, some stories shine bright--the true tale of the Meredith Victory, woven with the fictional story of a soldier who learns to leave bitterness behind for the sake of love, is one of them. This is a great read. I was born in Aug of 1950 and knew very little about the Korean war. David wrote about history in a way that was engaging, entertaining but knowledgeable. The mix between a great love story and the horrors of war kept me up past my bedtime on a work night. Just received notice today that I won this book in First Reads. I am looking forward to reading it. Thank you for the gift! A wonderful heartwarming story of the Korean War. Mustread! This is the story of the SS Meredith Victoria, a historical fact worth knowing. It is a novel about the Korean War and the rescue of North Korean refugees by this cargo ship. The main character is the US Marine private called Jack Stiles. His personal battle to find a reason to do his duty and his questions about the US involvement in a "civil war of animals". His transformation and empathy to a different race is moving. The author does a great job by describing the terrible conditions these people had to endure. He is ordered to retreat to Hungnam and at that moment he has to make a heart-wrenching decision: take thousands of North Korean refugees with him or leave them behind to be slaughtered by the Chinese. The narrative portions if this book are well written but the dialogue is atrocious. Did people really say "What's up?" in the 1950s? I don't know but do not think so. The dialogue is largely laughable or so lofty as to be unbelievable. It really disrupted the flow of an otherwise well written work. HopeThis book was a tribute to maintaining humanity in the midst of brutal inhumanity. It paid homage to the sacrifices made by many to help total strangers in need half way around the world. A great storyNot only a great story but very interesting history. At least I think it history. I will look for more of this author's books. Books Related with Hope in Hungnam by David Watts Jr.